Pint-size trick-or-treaters and Mommy’s (or Daddy’s) Little Helpers alike will appreciate RuMe’s reusable totes designed for the younger set. Made from durable, water-resistant polyester, and emblazoned with adorable graphics (rocket ship, cupcake, peace sign, elephants), the fairly made bags are capable of holding up to 30 pounds—that’s a lot of candy! Pint-size trick-or-treaters and Mommy's (or Daddy's) Little Helpers alike will appreciate RuMe's reusable totes designed for the younger set. 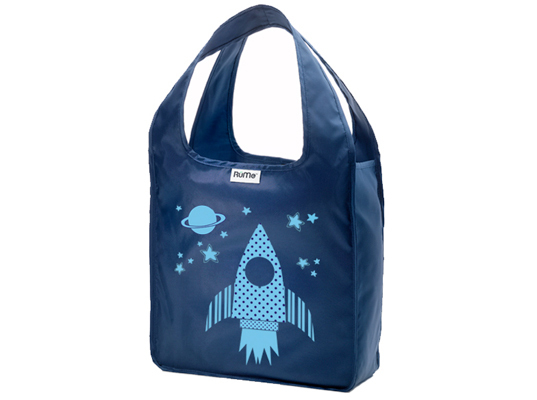 Made from durable, water-resistant polyester, and emblazoned with adorable graphics (rocket ship, cupcake, peace sign, elephants), the fairly made bags are capable of holding up to 30 pounds�that's a lot of candy!